"A recipe I tried while using leftover chicken breasts. A veggie variation on the yodelay-hee-hoo classic Swiss Chicken." We loved this recipe! I did make a few minor changes to satisfy my family. 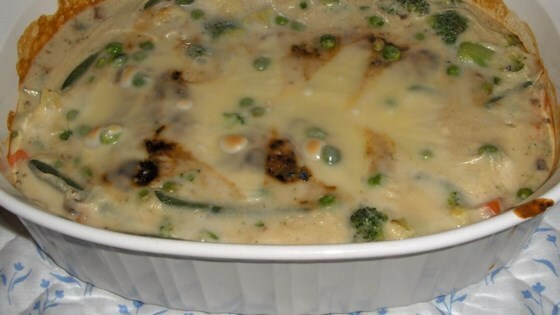 I changed cream of mushroom to cream of chicken and I used broccoli instead of vegetable mix. Very yummy! This recipe didn't really have a lot of flavor and the Swiss cheese doesn'r reheat well at all. We probably wont make it again. This was delicious! I couldn't believe I was actually excited about leftovers for lunch. Good, very very good... it's a keeper for sure. the swiss cheese is what MAKES it! Flavor was really good-I am freezing the leftovers for lunches. My hubby loved this dish, and he is very picky. I added fresh basil and parsley, as well as dried oregano and thyme. I served it over buttered egg noodles. Very delicious and easy. Added minced garlic instead of garlic powder. Also, salt and pepper the chicken breasts when you cook it!